Lots of times I post pictures of models and tell you that I used a variety of complex techniques or other cool tricks. Sometimes it can seem like if you don't do all those fancy things, you can't have a nice looking model. That's simply not the case. While all the cool tricks definitely have their place and in some instances can make achieving a certain look very easy, you don't have to use them every time to get a nice looking model. 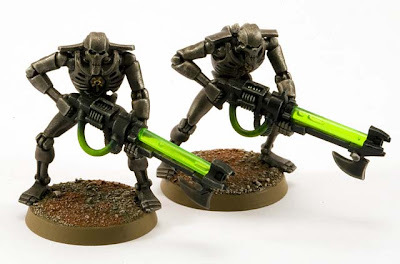 Case in point are the Necrons seen in this post. A reader sent them to me after deciding to use the Necron tutorial I posted with some of his own modifications. "Now, I thought that this would be a walk in the park and be a great way to master my drybrushing and be sloppy and fast with the last of the old washes. 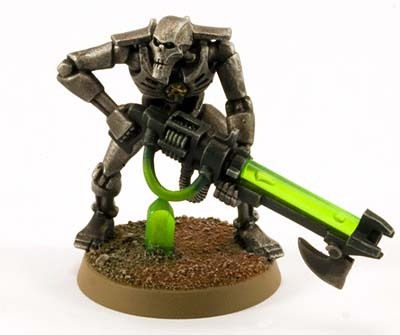 But being a massive researcher on everything new I'm about to try out, I stumbled upon Ron's great Necron tutorial. I was kind of bummed of the "lack" of drybrushing in the tutorial, but decided to go a head and try it out. The end result Ron posted really hit the feel I have of Necrons, ancient, dirty and rusted. I think I did the tutorial justice, but judge for yourselves. It should be noted that I have no pigments, so I had to let that one slip, I tried with some ground up pastels, but I only used them on the bases to create some contrast on them. It worked, for the most part, so I'm gonna wait for some real pigments to try them out on the models themselves. Also I opted for a lighter drybrush on the gauss weapons and giving them a liberal wash of thrakka green and badab black, so that they would stand out more from the main part of the model." 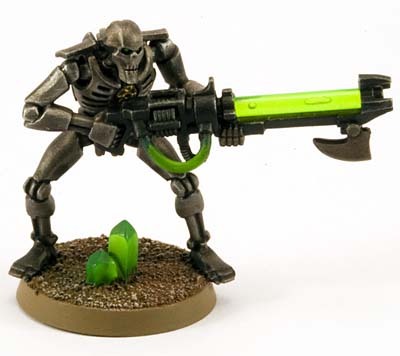 I think he's done a great job with these Necrons and I'd be proud to play with them any day. I think the real trick when it comes to painting is to find the look you like and then work on the best way to get that. And by "best" way, I mean the way that works for you and is easy, quick and keeps the process enjoyable. You don't have to use every painting trick when it comes to painting your army. I use a couple of techniques regularly because of the results I get and I skip out on all of the rest of them that don't really work for me. That's not to say they're bad, they just don't do what I want or I just don't need them in certain paint schemes. Find what you like, use what works and enjoy painting. Well said and that's a great looking model. It has a dark menacing look that suits it. Painting has style. The models I enjoy the most are the ones where the painter's style is apparent regardless of technique. Techniques can aid in your style but shouldn't define it either. "Find what you like, use what works and enjoy painting." Thor: Excellent point... techniques should aid and not define. I think so many folks try for perfection of techniques instead of just painting in the style/method/approach they enjoy and what looks good to them. Wow! I really love the colour on those bases. They are so simple in terms of texture but just the subtle colour change looks so great. Awesome. It is always nice to see when others put your work to action. Hopefully those type of models keep rolling off the line! Soon he'll have an impressive force. Zab: They're nice and simple. Fayte: It is nice to see someone put a tutorial or tip to use and come up with something they really enjoy. I think the models look great as well. They look great and well above what I would call table-top quality, even if the process is simple the result is great. I'm all about the practicallity of simple painting myself, because playing a fully painted army is much more appealing to me than one that only has one unit painted to a pro-standard while the rest of the units wait their turn. Stephen: Simple processes are often the best. I'm with you about a painted army. It's much more fun to play a fully painted force than an unpainted one. I don't know. Even following your How To Paint White The Easy Way I still completely fail at it. Some simple processes work for me but others are that simple I think my brain just complicates them for the hell of it. Bob: Yikes, I'm sorry to hear that white is giving you so much trouble. It is one of those colors that can give folks a very difficult time in trying to get a nice, smooth finish with consistent shading. Bob: Drop me an email, I might be able to help you out some more with painting white. I honestly think it's down to the wash i've been using and patience. My latest blog post explains it all. The plan is to get a old of some Secret Weapon washes and try that.